Catherine Tran has been a spiritual director since 1996. She received a Master of Divinity in 1994 and a Master of Arts in Theology in 1995, both from St. Thomas Seminary in Denver, Colorado. In 1998, Catherine earned a Certificate in Spiritual Direction from Shalem Institute in Baltimore, Maryland. Since 1996, Catherine has been a member of a Spiritual Direction Peer Supervision Group guided by the Rev. Jane E. Vennard. She has been a spiritual guide for individuals in various spiritual traditions, for couples, for persons discerning vocational questions, and for persons with short and long term spiritual guidance needs. Catherine has provided training and guidance for group spiritual direction, and has led retreats and training events. Her own spiritual journey began in earnest in her youth and has been shaped by contemplative practices and creative exploration of the mystery of God. 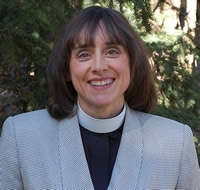 Catherine was ordained a priest in the Episcopal Church in 1995 and serves as the C0-pastor at Grace Episcopal/Methodist Church in Buena Vista, CO. Prior to being ordained, Catherine had a career in business management. Catherine is a musician and also enjoys just about any creative endeavor. She is married and has two children.